Plant tissues. Storage parenchyma. Atlas of plant and animal tissues. Organ: root, storage parenchyma of root cortex. 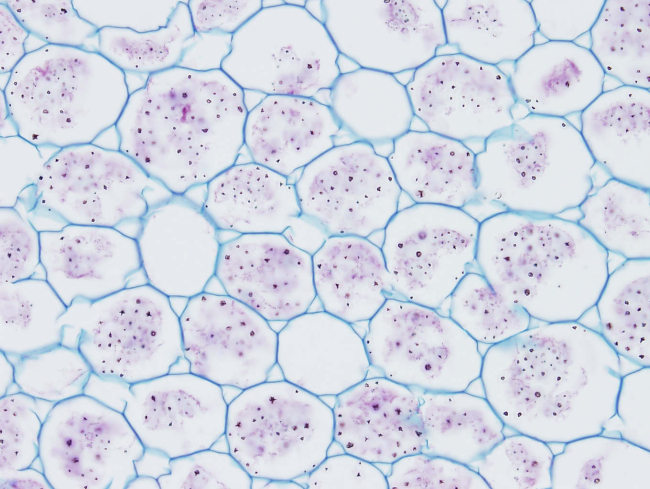 This figure shows root parenchyma cells with storage inclusions, probably starch, that appear as purple grains. Cells are rounded in shape, and have primary cell walls since they are stained in blue by blue Alcian dye. Some cells lack of storage material, but it can be a consequence of the histological process. Many empty intercellular space can be observed.